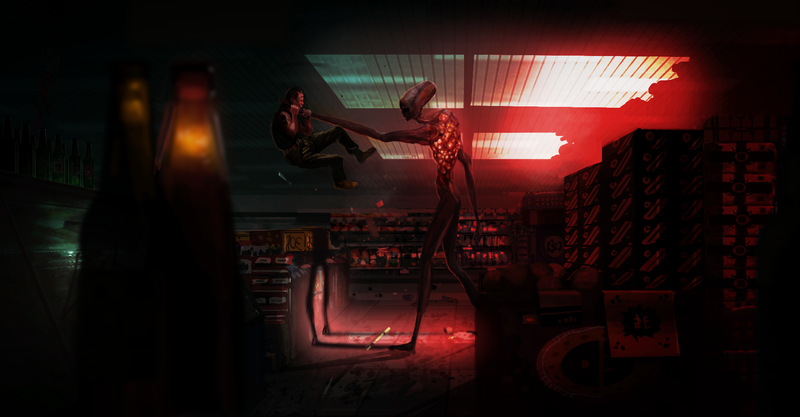 This week I sat down to talk to Ariel Arias, one of the developers behind The Hum, an alien-invasion horror game developed in Argentina. All English is kept as written, with no editing done to the text. 1. How are you, and would you like to tell us a little about The Hum? Well, in first place, The Hum is a very important project for me. It’s more than a game. It’s more than trying to scare people. I’m sharing some phobias from my younger years and how I overcame them. You will find many of my passions and inspirations on this game too. So, basically, you will find in The Hum a horror game with a little more than horror. I hope to have something playable to share soon! 2. The Hum is being funded through Kickstarter. How is that process, and do you think you would have preferred to have gone with a publisher? The doors are opened yet for publishers. Kickstarter is my first attempt in order to reach a good funding for The Hum. I hope this works and I am confident with it, even if at this moment (first week) the numbers doesn’t help. But if the kickstarter fails, I will find a way to make this game. Some publishers and investors told me about their interest on The Hum. And that’s great. But I wanted to do this Kickstarter because because I felt it natural as first approach for an indie like us. 3. You’re going to be showing the game at GamesCom. Can you describe the process about making a demo for a show floor? Well, to be honest, there is no public demo for Gamescom as I announced some days ago. We had problems with our DK2 shipping here in our country with customs house retains so there was not enough time for close a proper demo. I still will show some private builds, since we will be at Business Area for press and meetings. I hope I can solve this soon in another event like PAX. 4. Why is the game called The Hum? When I started The Hum in the middle of 2013, the game idea was basically the same, but I was searching for the proper name. I explored things like “Obscured Sky” but it was so…. “Falling Skies” … I tried many names, until one day, when a friend came to visit me and talk about the project idea. We watched some videos about weird phenomenas and aliens (one of our favorited topics) and then, the “windsor hum” phenomena came to scene. It is a weird phenomena that involves a strong omnipresent sound that is heard in many places around the world. I took it as a key element for the story of the game and it is working very well. But I will not tell much more yet! 5. Why is the team called Thotwise? 6. What is it like developing for Oculus Rift? Oculus Rift is just great. When I tried it for first time, I could not believe how cool it felt. The basic integration with game engines like Unity or Unreal Engine is very simple, but soon I discovered many things that you should take into account. Usually, in first person games, many thing are so much faked. The perspective, the movement speed, the size of the elements, etc, etc. But, in Oculus, you need to go back to the a feeling of realism. And there are many great visual effects and feelings from movies or games that you need to learn how to do inside a VR experience. If you just try to do a cinematic scene inside VR, it will not work in the same way that in a common screen. I’m confident that we are taking a good approach of how to use the VR experience in The Hum. 7. What has been the easiest part of developing The Hum? The first prototype of the game was a very smoothly process and that’s was great. If I want to try fast prototypes of ideas that is, usually, a smooth process thanks to the tools and engine we are using. It’s no like old times when you needed to program everything before see your player moving! 8.What has been the hardest? Right now, we face many challenges. The aliens AI is one. I don’t want something like “super advanced aliens that seem like stupids”. There are some things we are exploring on gameplay like time-space manipulation or very weird alien technologies and maybe this is the hardest part because… how an alien technology actually is? I like so much the Sci-fi series and movies with aliens like Star Trek or Star Gate SG1 but, something is hilarious how human is the technology they use. Of course this limitation is understandable , and is not a real mistake from writers, they are humans… not aliens. So maybe the hardest challenge on The Hum is find a way to make the players feel like they are actually facing aliens with an advanced and radical different technology. 9. If your Kickstarter doesn’t go as planned, what will you do? Keep working hard! If Kickstarter fails there is still some possible doors from private investor. If that fails too, we can still making The Hum as part-time and so on. This project will be a reality soon or later! 10. What other games are you a big fan of? Wow, I can mention so many games! I have started playing with 2 years old in my (I still have it) ZX Spectrum! But there are many games that I just love and that moved me to be a game developer. I’m a truly gamer and what I love from games is the huge possibilities they bring to people. From very competitive games to slow, story based experiences. They are great, and it’s just the begining. I’m sure that gaming will be incredible in some years!